I'm really looking forward to Wednesday when the twins will be singing in the Kindergarten concert. They have been practising their parts at home but it's all a big secret! I hope it's as entertaining as the spring concert when Max's trousers came undone and he had to sing, do all the actions of the song, and haul his trousers up at the same time. And we have it all on video! Such a lovely post,Marie. 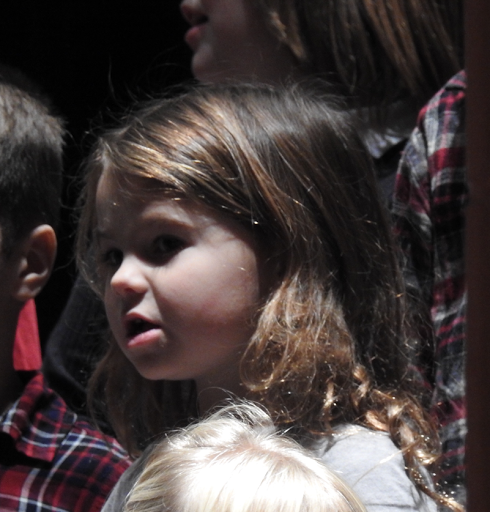 Your grand daughter, Sylvie had a wonderful experience,singing with others. Those little students are pretty.I studied at a music college for 4 years. My major was piano, but I like to sing at a choir too.I enjoyed singing with other members as an alto singer, actually my voice was soprano though. My part had to be alto because there were many soprano singers. When we practiced singing I was carefully listening to other members'melodies in its in harmony between soprano, alto,tenor and bass together. It was a long time ago. Of course I have no video,CD and you tube! I have many fond memories of junior church choirs and glee clubs too! Yes, times sure have changed and although I never sang in a choir it was wonderful to listen to one. A symphony orchestra has rented our church for a performance this Saturday evening and two local school choirs will perform as well and I will enjoy every minute. Danica will be in the school choir next week. It's a Catholic school, so there will be plenty of the traditional Christmas message. you were so lucky that you were able to attend! 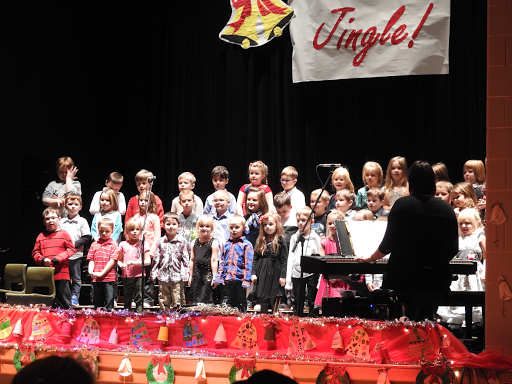 Children's concerts are the best thing this time of year. Love the music and the sweet faces. I remember the choir we were in grade school. I remember being the end person on the top riser and fainting and hitting the ground, too. It is so good for the kids to participate in school concerts or church Christmas program! It does indeed teaches them good things. It seems to me that it was only yesterday that our kids were singing in those programs and now they are grown adults. Your granddaughter looks so cute!! I suspect the warm hearts of family and friends filled the room. And would be very surprised if there weren't a few leaky eyes at the triggered memories. Our little sweeties are young for so short a time. We are so fortunate to be able to spend time with them. Enjoy the concert on Wednesday! You are such an adaptable person that I imagine you childhood involving the military had a hand in it. Along with your parents of course. Choirs are wonderful experiences for children. It sounds like your choir experience, though short, was great. Those days, without social media, are etched in our minds only, Tomoko. Today, everything is recorded in one form or other. I guess it's a good thing? It was a great concert, Andrea. The kids were wonderful! We were lucky to have such great experiences in choir, Debra. What a great opportunity for the kids, Judith. Enjoy! They make the season special, Tabor. Good heavens, Joanne. I hope you weren't badly hurt. Thank you, Angela. She is one of our sweeties. Time goes by too quickly! We must enjoy every minute we get to share with them. There were tears indeed, EC. The circle of life is a powerful realization! Love to see those kids perform. Hopefully I can make to our children's program this Sunday. I remember singing in the little kids choir when I was five. My sister who was three was in it too but she couldn't remember the words so she whistled the tunes all the way through it. A little whistling angel. Sometimes I wonder what went wrong. Even the Morman Tabernacle choir's annual performance is a circus. Your granddaughter is an angel. I have wonderful memories from my choir days too! I agree that technology brings changes that are not all good, but of course, not all bad. We must strive for balance in all! Hugs to you today - hope the storm there hasn't been too awful for you! I've seen it on the CBC news. I don't miss those high winds at all! LOL. She is, as are all the little ones, SS. We had sustained winds of 90 km/h, -30 with the windchill and it was snowing. Just awful, but as you know, that's life on the island. I was told by the choir director to stand in the back row and just move my lips! I had friends who were told the same thing, FG. Now, everyone sings!